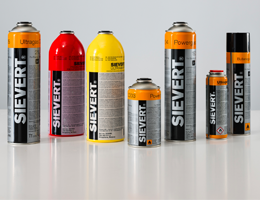 Sievert gas cartridges are filled using an automated weight control on the production line that weighs each individual cartridge. The cartridge is then tested for leaks by immersing it in a 55°C water bath for three minutes. If the cartridge weighs too little, too much or if gas leaks out during the water test, it is automatically removed from the production line and discarded. The various safety steps in the process guarantee that each cartridge is of the highest quality and completely safe to use.